A crippling road accident, polio, her husband’s countless affairs, a miscarriage, childlessness, a foot amputation, alcohol abuse and a lifetime of incapacitating chronic pain: Frida Kahlo transformed her pain into awe-inspiring art. Magdalena Carmen Frida Kahlo y Calderon, as her name appears on her birth certificate, was born on July 6, 1907 in the house of her parents, known as La Casa Azul (The Blue House), in Coyoacan, a town on the outskirts of Mexico City. Even at a young age, Frida Kahlo challenged the status quo: As a girl, she participated in boxing and other sports. She joined a gang at school and fell in love with the leader. In her adult years, Frida had a mischievous streak. She was described as scandalous by good society, and as funny, witty and vulgar by her closest friends. She often stayed out late at night and won tequila-drinking challenges with the burliest of men. She partied hard, but took her art and political views very seriously. 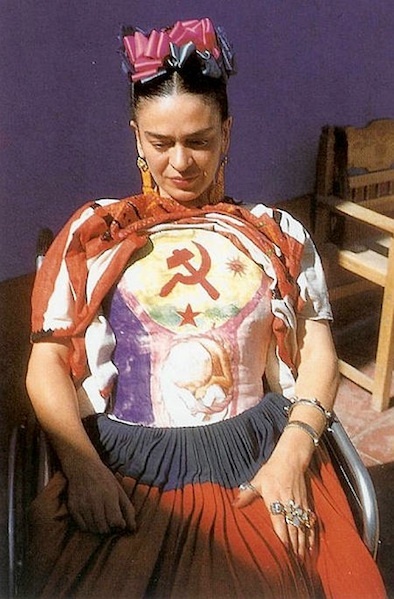 She was a fervent Communist and activist. Her political views, along with her physical and emotional pain, were channeled through her art.ejandro Gomez Arias. She often dressed as a sophisticated young man and later took women lovers as well as men (including Trotsky). Raised during the time of the Mexican Revolution, Frida’s lifestyle pushed social and gender boundaries. Childhood polio left Kahlo’s right leg damaged which she often concealed by wearing long beautiful Tehuana skirts. At the age of 18, she was seriously injured in a road accident – a metal rod piercing her pelvis leading to future miscarriages, numerous operations, a body cast, and incapacitating physical pain. 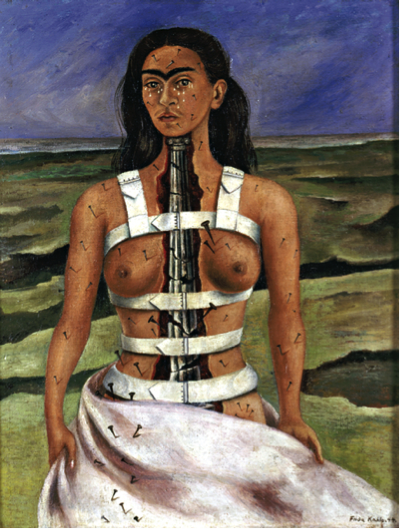 Frida’s physical pain became one of the enduring motifs of her work. Of her 143 paintings, 55 are self-portraits, which often include interpretations of physical and psychological wounds. “I suffered two grave accidents in my life,” she wrote. One was the tram. 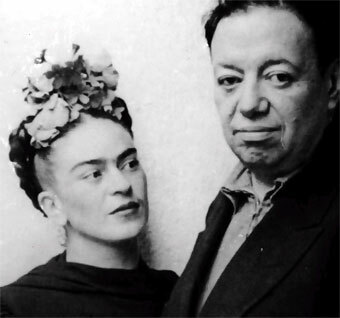 “The other accident is Diego.” She and the Mexican muralist Diego Rivera first met when she was 15, and a student at a college where Diego was commissioned to paint a mural. After meeting again in 1928, they married the following year. 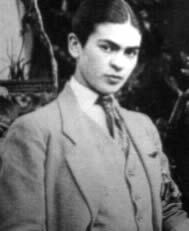 “She is the devil,” Frida’s father warned Diego during their engagement. “I know it,” he replied enthusiastically. By 1939, Frida and Diego were divorced after Diego began an affair with Frida’s sister Christina; however, Frida and Diego remarried the following year. They were obsessed with one another. And despite tumultuous arguments and separations, Frida and Diego could not leave each other for long. 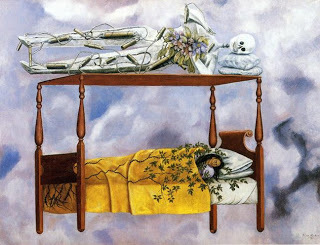 Drawing on personal experiences, Frida’s art doesn’t just leave an impression. Her execution of suffering-to-canvas shocks you (like a slap in the face), forcing you to experience her physical and emotional agony on a personal level. In The Broken Column her spine appears as a shattered column, with nails hammered all over her body. While her physical agony is apparent, her work also fearlessly depicts body parts in grave detail and expresses the intensity behind her emotional conflict. 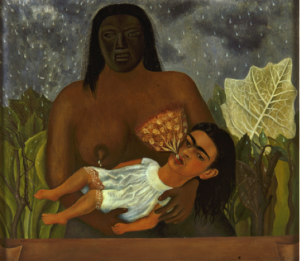 Frida often explored intimate female experiences through her work. She reversed the privacy of female social norms by openly portraying themes of pregnancy, breastfeeding, infertility and menstruation. In My Nurse and I, Frida’s interprets breastfeeding, a hidden behavior at that time, as an universal pursuit to be celebrated, and portrays mothers as the goddesses of the universe. Frida was deeply influenced by indigenous Mexican culture, which is apparent in her use of dramatic symbolism and bright colors. Christian and Jewish themes are often depicted in her work as part of her ancestry. She combined elements of the religious Mexican tradition with surrealist interpretations. Her work is also hopeful: “Tree of Hope, Keep Firm,” she wrote on a painting of a treeless landscape. 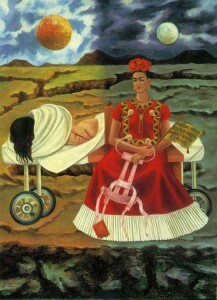 Frida’s work was exhibited on an international level. In 1939 she went to France and her work was featured at an exhibition of her paintings in Paris. The Louvre bought one of her paintings. The Frame (1938) was the first work by a 20th century Mexican artist ever purchased by the internationally renowned museum. I admire Frida’s refusal to limit herself to artistic labeling. “I paint my own reality,” she wrote. 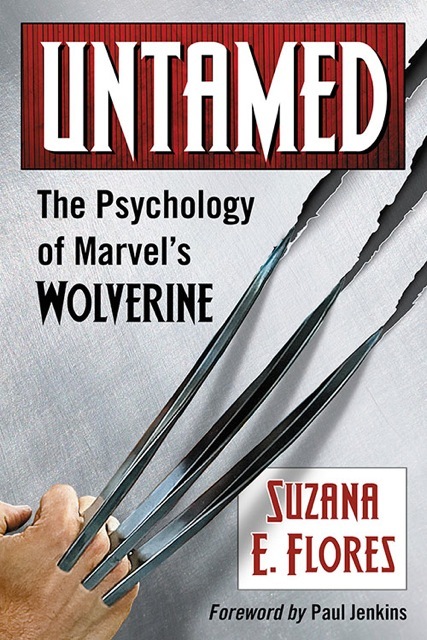 But if I had to name a single quality that I relate to personally, and draws me most to her work, it’s defiance. Frida’s defiance is apparent in her ability to shake perceptual reality: blood becomes paint, the spine converts into a column, vines grow into a blanket, and hair transforms into thorns. 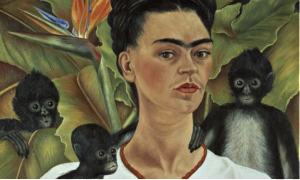 Throughout her life, Frida defied social and sexual convention, gender roles, and identification as victim: although her physical body became disabled, she created savage beauty by transforming it into a work of art. Working on her last painting eight days before her death, she inscribed into the painting a three-word declaration: VIVA LA VIDA. Long live life. Amen Frida…and Happy Birthday. 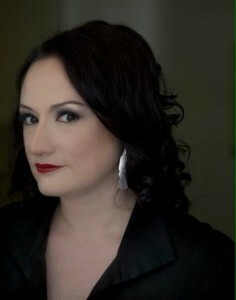 Dr. Suzana E.Flores is the resident clinical psychologist to Prose & Cons and author of Facehooked: How Facebook Affects our Emotions, Relationships, and our Lives, due out October, 2014 through Reputation Books.